Lannah’s email address is no longer valid. I have a six year old niece that had this stuffed dog she received from her grandmother about two years ago. 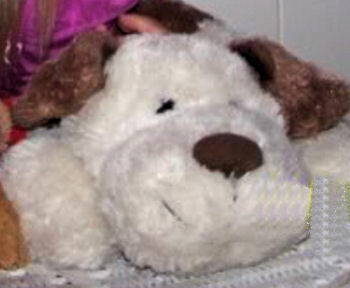 It is a plush dog that is a white color with brown ears. It’s about 18-21 inches from snout to tail, made by Goffa Int’l Corp.
My niece was playing outside with it a few months ago. She threw it over the fence in our backyard where an old lady lived. The next day when she told us about it, we went to get it only to find it gone. It turned out that the old woman who lives in the house behind us had thrown it away for being in her yard. I would really appreciate any help with finding it. Lanna found a fuzzy picture of what she thinks is the tush tag. Do you recognize it? I think it is a Ganz Homer?. This might be a smaller one. What do you think? Hi, I’m the one who wrote this thread; my email has changed since I have posted this. I am sad to say that I have not found this plush as of yet, and my niece who is now 8 is still asking for him. If anybody is still helping the search, I appreciate it greatly. I have confirmed that it is indeed a Goffa brand toy, as my dad had bought her another one that was white and black. It just wasn’t the same, I guess. She didn’t care for it. Thanks! I have updated information. 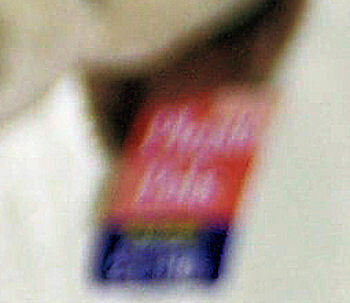 This may not help much, but I found an (incredibly blurry) picture of the dog with the tag still attached. Maybe id someone recognizes the tag color, it may help. I can’t decipher what the words say.